Hi and Happy Leap Day! Here's a card I made for a few challenges: FTTC158, RCC42, SSSC153 and the Kraft Journal. This is my first time coloring up these yummy tomatoes from the Italian Garden set by Flourishes. It took a while, but I was able to achieve the look I had pictured in my head. The image is cut out and was popped up on a pre-cut doily. And how lucky for me that I remembered that I had this dp which works perfectly with the image! I used pinking shears for the edge of the sentiment tab and also on the edges of the gingham layer. Linen thread, lace and die-namics top it all off. Thanks for stopping by! TS Monday - a color challenge! Hi and happy Monday (let's pretend, ok?!)! This week, we have a color challenge for you on the Totally Stampalicious blog - green, brown and yellow! For my card, I've used the newly released Gus Golfer. There are three hilarious sentiments, so it was hard to choose one! LOL! The sketch is from last week's Sweet Stop Sketches and I thought it went perfectly with Gus. I embossed the circle layer behind the main image so that it had a "golf ball effect". Everything was colored with copics. A button, brads, twine and die-namics finish it off. Thanks for stopping by and we hope you can join us in our challenge! Hi and TGIF! Everyone looking forward to the weekend?? We have a baseball tournament to go to (no surprise there!) and will be hosting a poker party Saturday night. Fun, fun! I did a cycling class for the first time today, so my only concern is that I'm going to be in pain all weekend, HA! I loved the class, though! Here's my card for the MFTWSC60 and also for the latest Color Throw Down challenge. Minimal stamping and super cute die-namics make for an easy peasy card! Thanks for taking a peek and have a fabulous weekend! Hi! Happy Mardi Gras!!!!! I grew up in Louisiana but haven't lived there since I joined the Air Force in 1990. I SO miss parades and REAL king cakes!!! GOOD TIMES! Here's a card I made for the MFTWSC59. March is right around the corner so I decided to ink up this "lucky" a la mode. Her jeans were paper pieced, as were the clovers. Everything else was colored with copics. I'm really diggin' this Spring-y color combo! Hi and happy President's Day! This week we're challenging you to make a baby card, whether it be to welcome a new blessing or celebrate their first birthday, break out those precious stamps! 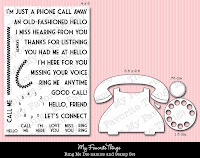 I'm using one of the super cute images from the NEWLY released Funny Strollers by Totally Stampalicious! I colored the chick with copics and paper pieced the blankie. What a sweet sentiment, huh!? Such a darling set, I tell ya! Brads, twine and some die-namics finish it all off. Thanks for stopping by and have fun check out what the other TS girls have whipped up for you! Totally Stampalicious New Release Blog Hop! Welcome to the February New Release and Blog Hop!! We are super excited to share another round of stamps from our witty, hilarious and just plain ol' adorable Bugaboo Line by artist Jodie Mackrell of Bugaboo Digi Stamps! As always we want you to play along in our Release Blog Hop so we're going to give away some PRIZES!!! All you gotta do is comment your way through the hop and YOU could be a lucky winner!!! Don't forget that Totally Stampalicious also has an awesome promotion going on right now! For my first card, I'm using the new Stella Peeker Darth Vader. Oh. My. Word. I LOVE her!!!! She's colored with copics and was cut out and popped up on dimensionals. For my second card, I've used Scarlette Cupcake. I went with a pink and brown theme for this sassy chick! She was colored with copics and glitter pens. And for my final card, I've used this sweet baby from the Funny Strollers set. What a sweet face!!! And here is the entire Blog Hop Line Up in case there are any glitches along the way! Thanks for taking a peek and enjoy the rest of the hop!!! Happy Shopping!!! Hi all! I wanted to share a boy birthday card that I whipped up on Saturday right before my 8 y.o. went to a birthday party because, well, that's just how I roll! I adore this kiddo from the Sweet Birthday Kids set! He was colored with copics, cut out and popped up. The sketch is from Deconstructed Jen's blog. Thanks for taking a peek! 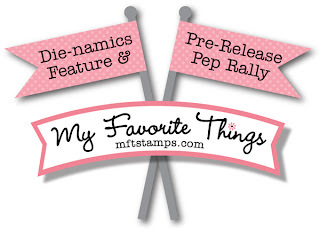 See you TOMORROW NIGHT for the Totally Stampalicious NEW RELEASE BLOG HOP!!!!!!! Yea, buddy! Hi all and happy Monday! This week Totally Stampalicious is challenging you to add texture to you creations! A pretty easy challenge, if you ask me, since there are tons of cool embossing folders out there, not to mention other materials like felt and cork that can jazz up your projects. For my card, I've used JJ Desperate Housewife. I colored her with copics and paper pieced her apron. The sketch is the February SFYTT so I used the out of the box technique when I cut her out to make it work with the sketch. As you can see, the kraft layer behind her was run through my 'bug with an embossing folder. Behind the buttons, I've added some die cut felt. Other details include brads and faux stitching. Here's a pic at the inside and one of JJ's sarcastic sentiments! Ha! Thanks for stopping by and be sure to check out what the rest of the TS girls created for you! AND be sure to come back THIS THURSDAY because it'll be NEW RELEASE DAY at Totally Stampalicious and we'll have a blog hop showing off all of the newest TS goodies!!! Good times, good times! Hi! Ready for another MFT card?! I thought so! Here's my take on this week's sketch #58. I know I'll be using this one again and again! This is the newly release PI Purrfect. I was going for an orange tabby cat. I fussy cut her and popped her up on pop dots. The flower is the new Botanical Beauty die-namics which you must go get NOW! :) I used the two smaller flowers and all three centers because they're TOO COOL! MFT Product Tour - Hello, Friend! Hello again! It's time for the Product Tour which means all of the new sets and die-namics are available NOW! Feel free to RUUUNNNNN to the MFT store now or check out my card then RUUUNNNNN to the MFT store! Hehe! 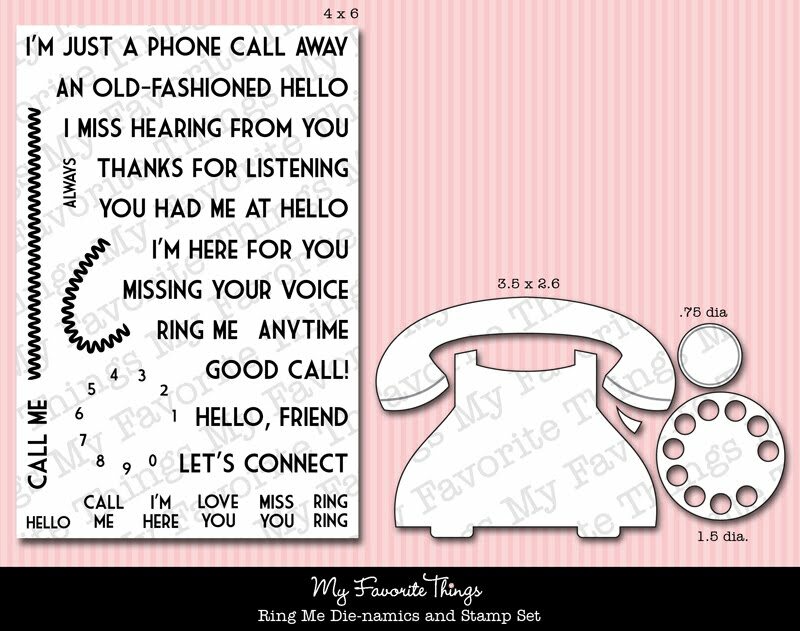 I'm featuring the Ring Me set and matching die-namics. I ADORE this set!!! It is SO fun! The font is wonderful! Here's a peek at the inside. I did second-generation stamping on the cord in basic grey ink. Here's a details shot. I didn't adhere the bottoms of the mix & match banners so I could curl up the ends a little and add more dimension. I made my own "epoxy" brad using some diamond glaze. I completely ADORE the detail on this die-namic!!!! Other die-namics I used were the small scallop border, mix & match banner and the scallop ribbon border. Thanks so much for stopping by! Ok, NOW go to the MFT store and pick up all those must-haves before they're gone!!! And don't be a stranger!!! 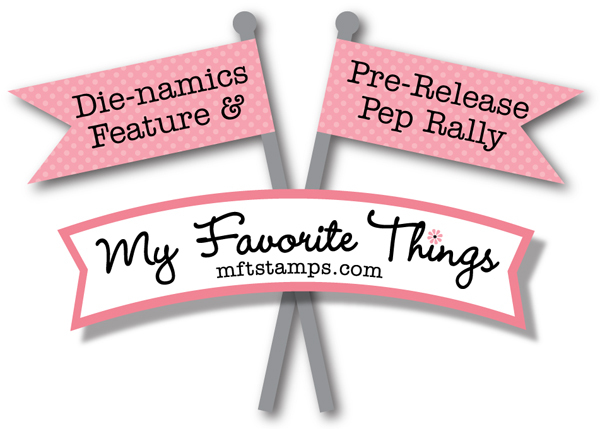 HI and welcome to the MFT die-namics feature and pep rally!!! It's FINALLY here ~ RELEASE DAY!! Wahoo!!! So, what is on your must-have list?!?! I know, silly question, right?! ;) I am so amazed at not only the amazing stamps and die-namics Kim and the crew come up with but also the stunning sneaks they put out month after month! I've felt so blessed to be a guest designer and dream of being a permanent part of this group of encouraging and sweet ladies. As the sentiment says, I'm chasing that dream! On to my project... I must confess... I didn't even start on this until after 2pm today (Monday). I'd been running ideas through my mind and then guess what?! I got new dp in tha house! 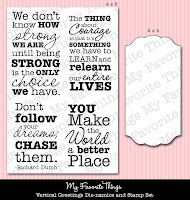 So new die-namics and stamps + new dp = INSPIRATION! This is a $1 wood frame from Michael's that I covered with dp. This sentiment from the new Vertical Greetings set along with the die were begging to be used. "Chase" was stamped on dp then cut out for emphasis. 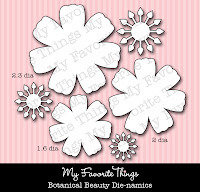 Also, I used the new Botanical Beauty die-namics. Oh SO GORGEOUS! The leaves/vines were cut out using the leafy flourish, the branches with leaves, and the vintage flourish die-namics. I added another heart behind the sentiment layer using one of the layered heart die-namics. Here's a detail shot. I had sponged all edges of the frame and woodgrain dp with cocoa ink. The heart and sentiment layer on up on pop dots. I think this would make a great gift for a grad or even a wedding gift. Thanks SO much for stopping by and for all of your super sweet comments! They are so truly appreciated, you have NO idea!!! See y'all at the release party and then back here for the Product Tour! TS Monday - Ribbon, ribbon, ribbon! Hi again! Time for the Totally Stampalicious Monday challenge and this week we want you to use up that ribbon you've been hoarding! Yep, use three different ribbons on your card! Here, I've used a lace ribbon, a satin ribbon and some twine (hope that counts as one!). The satin ribbon was ruffled. Can I say that this lady cracks me up! She's colored with copics and is up on pop dots. The sentiment edge was cut out with a die-namic. I rounded one corner and added piercing inside and out. A peek at the inside... Hilarious sentiment! Thanks for taking a peek and stop by the Totally Stampalicious blog to see what the rest of the girls have for you! Hi all! Happy Monday! First, let me say... GO GIANTS!!!! Oh, my husband is one happy man! He's just lucky they weren't playing my Saints, LOL!!! And now, it's Pure Innocence sneak time! With so many aDORable PIs to choose from, I decided to go with the Firefighter Boy. He was just too darling to resist! I kept it all pretty clean and simple with lots of layers and 13 brads! One layer was run through my 'Bug with an embossing folder and I pierced a separate layer. The sentiment was cut out with the mix & match banners die-namics which I attached to the pole from the mini pennant die-namic. He was colored with copics. A peek at the inside... I added more piercing, the postage stamp edge die-namic and added the fire extinguisher from the same set. Thanks for stopping by! I truly appreciate it!!! See y'all back here tomorrow for the PEP RALLY!!! Hi and welcome to A la Mode teaser day! My card features the Rock Star a la mode! Fun, fun, FUN! I totally "punked" her out with purple ombre hair and a baby blue guitar. The sentiment was cut out with one of the mini tabs foursome die-namics. I popped up some of the stacking stars die-namics and added the crown border die-namic to fancy it up. To further enhance the rock star theme, I ran the light blue layer through a star embossing folder. A peek on the inside... I stamped another sentiment from the set, added another star and the skyline border die-namic to go with the "You rock my world" theme. As always, thanks for stopping by ~ feel free to follow my blog ;) ~ and I'll see you tomorrow for even more GOODIES! Hi and welcome to day 4 of MFT Teasers! There are some AWESOME goodies to see today, so I'll get right to it! I had a tough time choosing which set to work with but decided on the gorgeous Finishing Flourishes. This set is a must have!!! There are several sentiments that cover any and every occasion and they are nice and BIG! And such a pretty font! AND to top it all off, there are oodles of different sized flourish stamps to fancy up a card in no time! Here, I've stamped two different flourishes using ruby red and saffron inks on the left panel. I couldn't resist adding a Botanical Beauty flower with a large pearl center. Other die-namics I've used are the small scallop border, leafy flourish, and the scallop ribbon border. Satin ribbon, extra little pearls and a bit of piercing finish it up. Thanks for taking a peek and see y'all tomorrow! MFTWSC57 - Picture perfect birthday!